I was a bachelor while aboard the Okie City. Married men were given "BAQ" pay to finance a home off ship for their families. When the ship was in Yokosuka they went home after work and on weekends, if they weren't in the duty section. Unmarried men were expected to live on ship, so the ship was our home. It isn't much of a home when you share a single room smaller than the average bedroom with three to seven other fellows, with two drawers and about one foot of closet space to store everything you own. That is, if you were an officer. 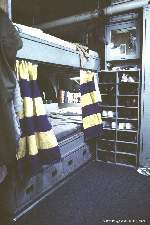 Enlisted personnel lived in bunk rooms with dozens of other men. There was no privacy. A ship is noisy day and night. 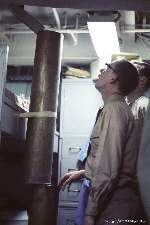 Ventilation fans hum constantly, and a variety of creaks and rumbles from machinery deep inside the ship or the brow sliding on the side of the ship contribute to the incessant noise. 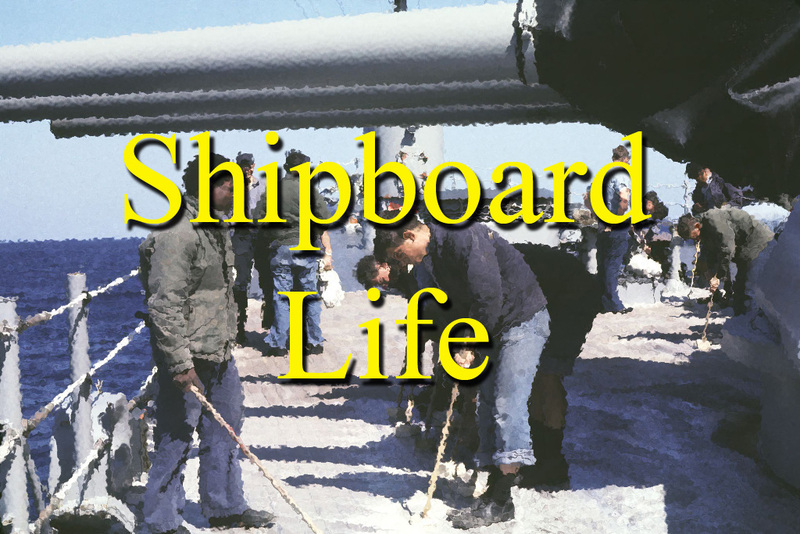 Shipboard life is highly regimented, with frequent announcements played on the ships 1MC general announcement system, preceded by the whistle of a Bosun's pipe or a bugle call. Reveille started the day in enlisted quarters. At 0715 the ships emergency alarms were tested. Officer's call was at 0745, followed by morning colors at 0800. Throughout the day bells were sounded every 15 minutes, and whenever the Admiral, Fleet Chief of Staff or the ship's Captain arrived or departed the event was announced throughout the ship. Mess call, sweepers, secure the mess line, mail call, late sleepers, occasional drills, etc., all preceded by the screeching of a bosun's pipe. This all occurred on weekdays and weekends. So even if you did not have weekend duty you couldn't enjoy sleeping late in your "home." 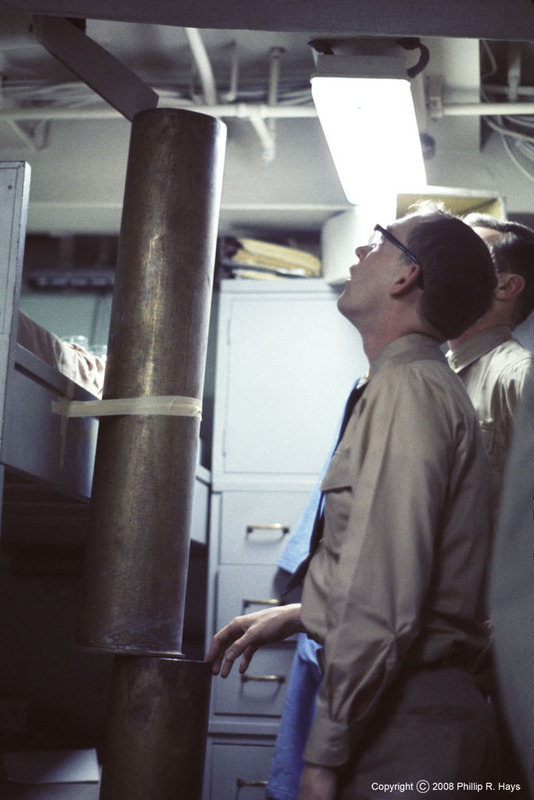 Routine maintenance in officer's quarters, like painting passageways or chipping (removing paint) in the heads (bathrooms), always seemed to be scheduled on weekends in port, adding to the misery for those who lived aboard. Of course the senior personnel who scheduled the work were at home ashore. If some noncritical piece of machinery failed on a weekend, something like an air conditioner, it would be Monday before it was repaired. 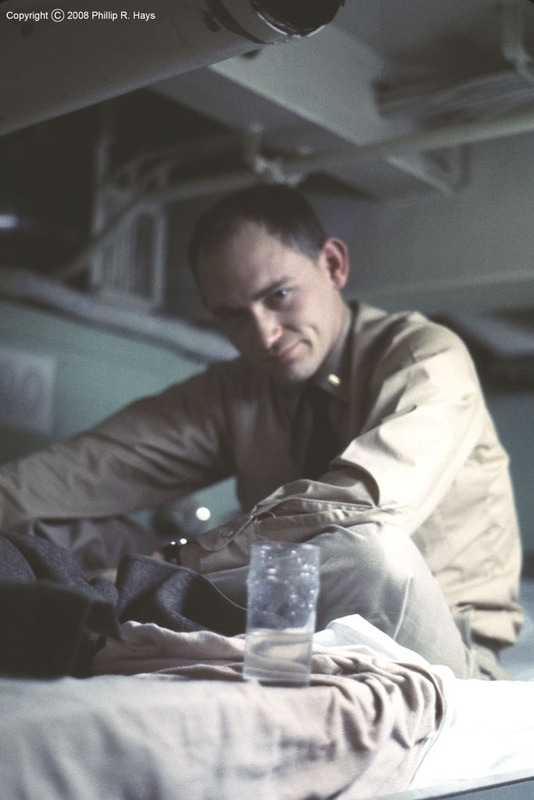 Here you see an unfortunate Ensign Durham with water from a broken cooling pipe dripping on his bunk. Unable to get it repaired the JOs improvised a temporary damage control measure made of empty 6 inch powder cases and masking tape. I guess this was one of those times that were supposed to "build character." When we were at sea we wore working khakis. This was a short sleeve shirt without a tie and work trousers. This uniform was comfortable and well suited for crawling around in machinery spaces. In port we were required to dress up. In winter we wore dress blues or khakis, a long sleeve shirt with a tie and suit coat and trousers. I always thought it was especially stupid to have people in machinery spaces with nooses hanging around their necks just waiting to get caught in moving machinery! In summer we wore a short sleeve white shirt, trousers and shoes. In working ports the ship was filthy, regardless of how often sweepers were called. Scaffolding stood everywhere, cables and hoses ran through the ship, and passageways were often crowded with machinery that was being removed or installed. The work raised dust, and chipping and painting went on everywhere. So we had the choice of inspecting our work spaces in a dress suit or a white uniform, or sitting in our offices where we had a better chance of keeping our uniforms clean. Wardroom and mess deck food was never very appealing, but the quality went down in port. Sometimes the crew's mess ran out of food before everyone was served. Meals in the wardroom in port were even less appealing because we had to wear our dress uniforms. So if we were wearing our comfortable "civvies" when off duty in port on a weekend, we had to change into dress uniform for the pleasure of dining in our "home." Or we had the choice to go to the Officer's Club or a restaurant in town where a uniform wasn't required - and the food was much better. I can't say the wardroom food was bad - it wasn't . It was boring. Cooking for hundreds or thousands of men was a challenge, especially when the food supply was institutional. To counter the bland nature of the food the Navy trained cooks to add color to each meal to make it more appealing. On the Okie Boat "color" meant bell peppers. Bell peppers in omelets for breakfast, salads for lunch and dinner, and cooked into just about everything. I loved bell peppers when I was a kid, but it must have been at least a decade after I left the Navy before I ate another bell pepper! We did dine off ship almost every night in port when we didn't have duty. 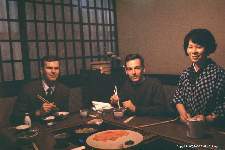 Here is a picture of LTJG Decoss and yours truly enjoying sukiyaki in Tokyo. There were many great restaurants in Hong Kong with just about any cuisine you can think of. Jimmy's Kitchen comes to mind first, then the Copper Chimney near the university and the restaurant (can't remember the name) in Wanchi that had wonderful Peking duck. Of course there were also a lot of bars in Wanchi - the home of Susie Wong. The most memorable restaurant was the Coq d'or in Kuala Lumpur, Malaysia. 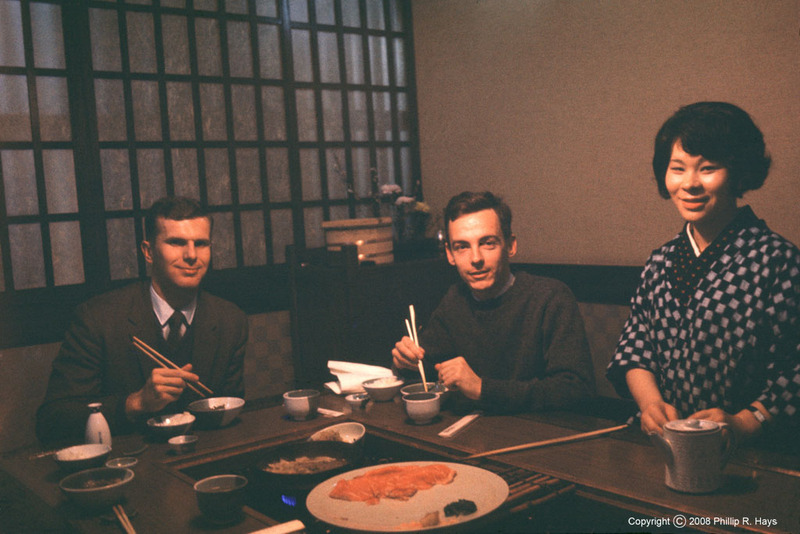 A couple of us were wandering around town sightseeing, and as evening came on we hailed a taxi and told the driver to take us to "a good place to eat." Often as not you will end up at a cafe belonging to a friend of the driver. We drove into a pretty ritzy part of town and I was admiring an iron picket fence atop a high stone wall when the driver turned through a huge wrought iron gate into a spacious yard surrounding a white marble mansion with a well kept formal garden in front. I was beginning to wonder if the driver had misunderstood our request - he had not! As we stopped doormen dressed as Sikhs opened the doors and a maitre d' greeted us. We had cocktails on the wide front porch and watched the sunset. When our table was ready we were escorted into the restaurant. Suits of armor flanked the doorway and a broad curving marble staircase descended into the entry way. We were seated in a room with a vaulted frescoed ceiling and tapestries on the wall, at one of maybe half a dozen tables. Each table had a waiter to keep the glasses full. Dinner was a delicious chateaubriand the size of a softball and fresh vegetables cooked on carts by the table. For dessert we ordered Baked Alaska, and enjoyed an after dinner drink while we waited. It was experiences like this that made the Navy really great. There were other experiences just as memorable, if not as great. We visited Subic Bay in the Philippines quite often. It was the closest supply depot and repair yard to the Gulf of Tonkin. Outside the navy base was the town of Olongapo, or "The Po" as it was affectionately known to "Olongapo sailors." Perhaps the best way to introduce Olongapo is to say it made Tijuana look like the Vatican. You could find anything you wanted, and a lot more, in the Po. Well, on one particularly long stay in Subic the XO and the ship's Chaplain teamed up to save our souls from the temptations in town. The work schedule was changed to start early and work through to lunch at 13:00 (1:00 PM). After lunch all crew members were ordered to participate in the "Okie City Olympics." From 14:00 to 17:00 (5 PM) everyone had to play a sport (baseball, touch football, pie eating, whatever). The idea was to get everybody so tired that we wouldn't want to go out on the town after supper. Of course it is very warm in the Philippines - not far from the equator, so the supply department provided trash cans full of ice and cold water, soda and beer to keep us from dehydrating. The beer was especially popular. Liberty began at 17:00. Some sailors went back to the ship for supper or to crash from exhaustion. Most didn't. Being well lubricated from an afternoon of sports and beer they were ready for a night on the town. And what a town! As you crossed the bridge leading from the base across the Olongapo River there were young girls dressed in very little waiting in boats below. Sailors tossed coins for them to dive after and when they surfaced little was left to the imagination through the wet cloth. Olongapo was like something out of a spaghetti western, with lots of saloons, people walking around with guns, and occasional shoot outs in the streets. It was a rough place and you needed to keep on your toes. The streets bustled with gaudily painted "jeepnies" - vintage WWII jeeps left behind after the war and modified into tiny busses. Children pushed through the crowds on the sidewalks propositioning sailors with "Hey sailor! You want to buy some gum? How about my sister?" If you were wearing a ring or a watch with a stretch band you would soon be amazed with the precision that a kid running by could slip it off your hand and then duck into a dark alley before you realized what was happening. You didn't follow into those alleys if you wanted to walk back to the ship. The Navy lost more sailors in The Po than were lost in Vietnam. The main street was lined with bar after bar. Most had pretty good bands and dance floors where a fellow could dance with a "hostess." There was no shortage of bar girls who were happy to talk with sailors who bought them "champagne" cocktails (actually soda or tea). They hustled drinks for the sailors and provided entertainment, often involving progressively less clothing as the night wore on. After a week of afternoons of drinking beer at the "Olympics" and nights on the town the Okie Boat got under way again and headed back to war. By the time we reached Yankee Station lines were starting to form at morning sick call. A week after we got to Vietnam the line stretched almost the full length of the ship. We ran out of VD pills and had to fly in supplies from other ships. Soon those supplies ran out and the Navy had to fly pills from Subic, and then from the States. I heard that a substantial part of crew had the clap - some said it was a record for the Navy. So I guess the Okie City Olympics was a success by some measure, but not what the XO and Chaplain had in mind. I went into the Navy thinking I might make a career of it. I thought the "job" was exciting, we did see a lot of the world, and I loved being on the ocean. Conning the ship (driving) was fun, especially when we were steaming in formation with other ships or holding station alongside a replenishment ship. After supper I liked to sit on the bitts on the bow and listen to the sound of the ship cutting through the water. Sometimes we would scare up a school of flying fish that would race ahead of the ship skimming over the water. Or we might be accompanied by dolphins. Sunsets at sea can be spectacular and the sky at night is absolutely black and filled with uncountable stars. Unfortunately, I suffer from motion sickness, and I soon learned to become nauseous as soon as the last line was released from the pier. It was a conditioned reflex, like Pavlov's dogs salivating at the sound of a bell. When the ship's whistle sounded three times to signal underway I immediately wanted to barf. On my first ship, the USS Cape MSI-2, I was unable to control the nausea and couldn't keep down food. Fortunately the Cape, a 112 foot minesweeper, was bolted to the pier most of the time and we didn't go out very often. The Okie Boat was at sea about 2/3 of the time, but because it was a much larger ship it didn't move around as much. I learned to live with the nausea and only threw up once or twice while aboard. Within a day or two after getting under way I got over the nausea and could really enjoy being on the ocean. Motion sickness was definitely a negative part of being in the Navy, but it isn't what made me decide that I wouldn't make it my career. It was the demeaning way junior officers and enlisted men were treated in the service that changed my mind. Naval officers are all college graduates, and those who went through civilian schools all had degrees that would give them careers in civilian life. The Vietnam War was at its height when I joined. The Navy was taking only college graduates for officers, and so many men had applied for officer training that only the top 12% were being accepted. I served with some very bright and talented junior officers, some with Masters and PhD degrees. This actually turned out to be a problem for the Navy. We all could leave the Navy and have promising careers in "CIVLAND," so we were pretty indifferent to what the senior officers thought about us. I think this was expressed best during a JO (junior officer) indoctrination session where the XO (Executive Officer - second in command) was telling us it was our duty to "spill our guts for our country" if the occasion arose, when one fellow piped up with "Not me! I'm just here to avoid the draft!" For the most part the junior officers were quite a bit brighter than many of the senior officers (but not nearly as experienced). Of about 200 junior officers who served on the Okie Boat during the time I was aboard, only two made the Navy their career. A one percent retention rate among people who were far brighter than average serves as a pretty valid condemnation of the Navy as a career. So what was it that drove us out of the Navy? The living conditions on ship were pretty bad, as I have described above, but sailors also serve part of their career in jobs on shore. There they can have a more or less normal home life. The occasional year or two on a ship just serves to enhance the appreciation of shore duty. I didn't enjoy the crowding and lack of privacy aboard ship, but it was acceptable. The visits to exotic ports more than made up for the unpleasantness of shipboard life, and the Oklahoma City visited more places than most ships. Inchon and Seoul Korea. Sapporo, Tokyo, Kobe, Osaka, Kyoto, Hiroshima, Beppu, Sasebo and Nagasaki in Japan. Kelung, Khaosiung and Taipei on Formosa (Nationalist China). Hong Kong! Manila and Olongapo in the Philippines. Sattahip and Bangkok, Thailand. Singapore, and Kuala Lumpur, Malaysia. We visited just about every place in Asia that didn't shoot at us, and a few that did. The liberty was great! Being an officer in the U. S. Navy was demeaning. The military rank structure forces people to lose their individuality and conform to a narrow standard of behavior. It categorizes people as mindless automatons who are expected to perform only a tightly defined set of duties and discourages all else. The military rewards those with longer time in service more than those with greater capabilities. The result is that people who have a promising career in civilian life quit the service (or avoid it in the first place), leaving only the less competent to gain seniority. I think many of the senior officer and enlisted personnel I served with would be incapable of having a significant career in civilian life. For them the Navy was home and "mother." Because they are the senior people in the service they have created a system that rewards incompetence. The influence that comes with seniority encourages bullying, so the service has a special appeal to people who like to torment others. Enlisted personnel not on duty were allowed to leave the ship in liberty ports after Liberty Call at the end of the work day. Junior officers were required to check out with a senior officer. 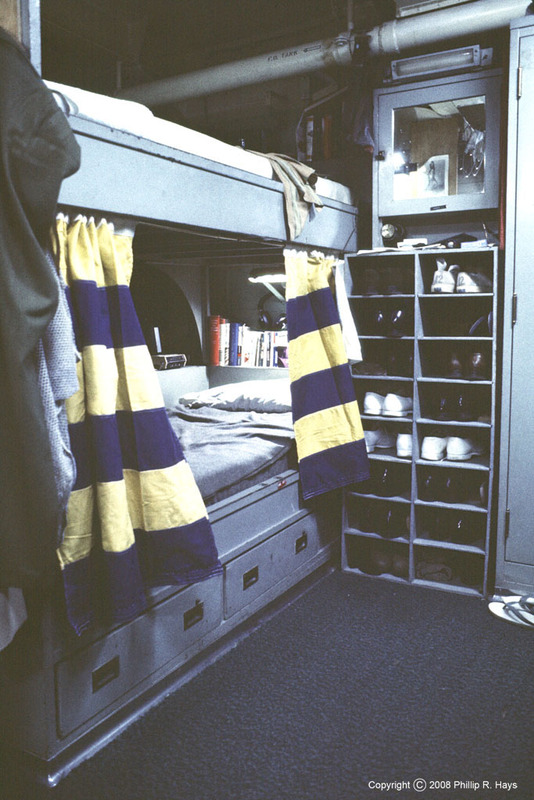 We were actively discouraged from leaving the ship, in fact some senior officers referred to it as "abandoning the ship," and they didn't allow Liberty Call to be sounded in junior officer's quarters. In a civilian job you may have to punch a clock, but you can leave work at quitting time. After a day working in a tin box we were tired of looking at pipes, pushing papers, listening to the noise of the ship, and we did want to get away and "see the world." Since we couldn't get away from the ship for weeks at a time at sea what few hours we could get ashore in port were especially important. However, junior officers were expected to be "on call" 24 hours a day, and often our liberty was curtailed for meaningless trivial jobs. The most demeaning job that I had to do was "Duty Doorman." When I was in the duty section in port (about every six days) I was expected to stand one or two quarterdeck watches. The quarterdeck is where the brow (a walkway or bridge) connects the ship to the shore. It is where people come aboard or leave the ship. On the Okie Boat we had two brows, the forward one at the quarterdeck for officers, and one amidships for enlisted and shipyard personnel. The after brow was manned by enlisted personnel, typically with a Chief or First Class Petty Officer in charge. In the winter they had a booth to stand in to keep them out of the weather. The forward brow was manned by a junior officer and an enlisted Bosun of the Watch. The Bosun stayed in a compartment in the superstructure, but the Officer of the Deck was expected to stand outside (we were not allowed to sit) in the weather, day and night, winter or summer, rain or shine. I have stood for hours after midnight with my back aching. My feet froze to the deck in sub zero temperatures one particularly cold rainy winter night. I stood one watch leaning into 60 knot winds. I nearly fainted while standing in 105 degree heat in the equatorial sun. I stood that watch for about 300 hours (13 full days!) while aboard the Okie Boat and hated every minute of it. What was I supposed to be doing on this watch? I was there merely to salute people coming and going, to inflate the egos of senior officers. I had a college degree and was highly trained for my profession, but I was nothing more than a doorman. It isn't much of a surprise that only about one percent of junior officers stayed in the Navy after their first hitch. To me it is surprising that anyone made it a career. I left the Navy after three years, four months and thirteen days, and took a well paying job in the profession I was trained for, running a medical mycology laboratory. I had a large apartment all to myself, and my evenings and weekends were my own. And not once in any job since leaving the Navy have I been required to stand for hours outside in a blizzard in the middle of the night on a weekend just so I could be there to salute in case the boss decided to show up! Talos missile operations. Missile shots. How was the main brace spliced?